Engineering and technology contribute significantly in transforming the medical sector in terms of digital equipment, diagnostics, R&D, automation and much more. There are several shows conducted around the world that honor the contribution of engineering and technology in the medical industry. Birk Manufacturing is proud to be part of one such event that focuses on the integration of the medical and engineering industries—the Medical Design and Manufacturing (MD&M) Expo 2019. Birk Manufacturing is a renowned manufacturer and designer of high-quality thermal systems and flexible heaters used in various diagnostic devices and semiconductor equipment employed in the medical sector. 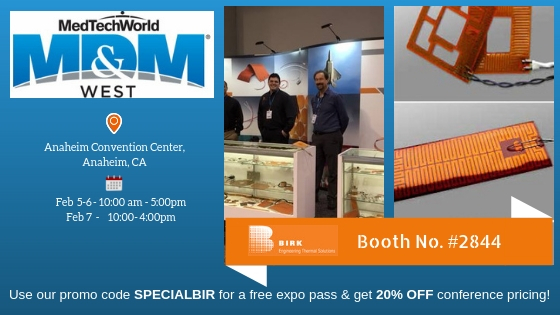 Birk Manufacturing will exhibit at booth number #2844. The venue of the expo, to be held February 5–7, 2019, is the Anaheim Convention Center, 800 W. Katella Avenue, Anaheim, CA 92802. Birk provides heaters in customized specifications, which are extremely useful for the medical industry in applications where a certain temperature range needs to be maintained, such as for preserving samples, DNA research, patient care, replicating body temperature for fluid testing, and so on. The event also provides Birk’s team with several opportunities to understand the latest requirements and innovations in the medical industry. It is also a good platform to connect with industry peers, prospective customers, suppliers and vendors, as well as to better understand the current market. 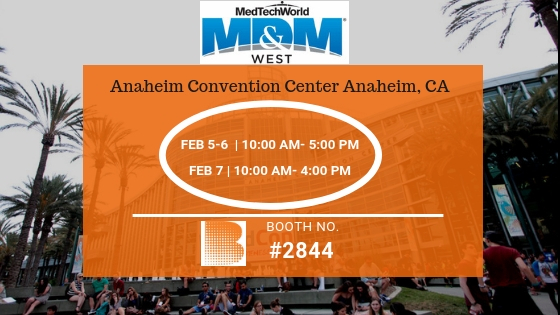 The MD&M event is one of the largest medical-device technology events in North America. It serves as a fruitful and beneficial platform for all medtech professionals. In addition to new and established manufacturers and suppliers exhibiting their latest technologies for the medical sector, the event also has a conference. The expo offers the opportunity to connect with over 19,000 industry professionals, 1900+ leading manufacturers and suppliers, numerous decision makers and thousands of attendees. It is held with the purpose of finding innovative solutions in areas such as medical plastics and packaging, R&D, manufacturing equipment, automation and assembly, and contract manufacturing. This year, the expo is expected to bring over 50+ thought leaders from around the world. The focus of the whole event is acknowledging various advances in the manufacturing and design of medical devices in the last year. Other than the obvious benefits, professionals can expand their networks, increase business prospects, learn and adopt the best manufacturing practices, and build on their innovation. Participants can actually get to know the practical applications of some of the most innovative manufacturing technologies. February 5, 2019 8:30 a.m. to 5:30 p.m.
February 6, 2019 8:30 a.m. to 5:30 p.m.
February 7, 2019 8:30 a.m. to 4:00 p.m.
With the expo date nearing, Birk is well prepared to showcase and explain its best-selling products to all the visitors at booth #2844. The team is looking forward to this three-day experience, which will help expand the company’s network and prove useful in the future.